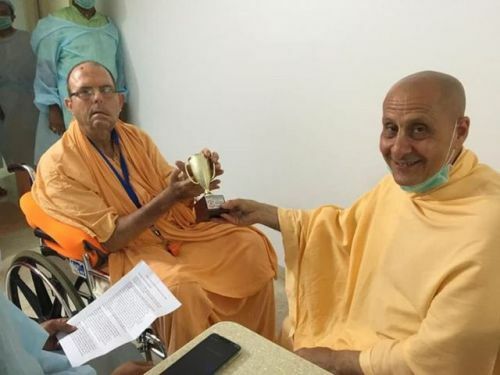 Last evening, HH Radhanath Swami Maharaja visited HH Jayapataka Swami and handed over Jayapataka Swami an award on behalf of a dear disciple of HH Giriraj Swami. Please accept my humble obeisances at the dust of your divine, lotus-like feet. All glories to Srila Prabhupada! All glories to your being the unstoppable hero of ISKCON! When I was thirteen years old, in 8th grade, one day, I was walking from one room to the other at our home in Pune. Due to my Muscular Dystrophy, my body had developed a lot of weakness, and that day, while walking to the other room, I had a fall, which fractured my right thigh bone. Due to that, I had to be on complete bed rest for three months, which led to increased weakness in my muscles, and I was bound to my wheelchair, for what it seemed to be forever. For many months following my fracture in October 2013, I was going through a big struggle: intense physiotherapy, going from doctor to doctor in the hope of finding treatment to help me walk once again, my school, studies and exams, my emotional, social struggles, and my very weak Krishna consciousness, which was collapsing in front of my very eyes. I was trying hard to rise from the biggest fall I’d ever had in my life. I did not want to give up. My school teachers were observing all this, and to our surprise, they gave me an award called “Endeavour Against Insurmountable Odds”! It seems they were very impressed with my performance. My dear Jayapataka Maharaja, you are the biggest hero I have ever seen in my life, and I am nearly sure that I will never see another hero like you. Na bhuto na bhavisyati. There is absolutely no one like you. 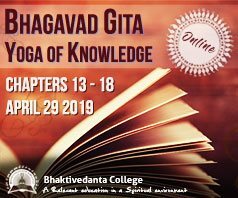 You are not stopping, and are showing me and countless others, how to have maddening love for Guru and Gauranga, how to not “give a damn” to anything that stops us from serving Srila Prabhupada. Maharaja, this is the only trophy I got in my entire school life. As I am writing this letter, I feel that Krishna gave me this award, so that one day, today, when I will feel so deeply inspired by you, I will have this award to give you, to help me give you something in return for all the strength even just hearing your name gives me. So, dear Maharaja, along with this letter, I am sending the award “Endeavour Against Insurmountable Odds” I was given by my school in 2014. I don’t think it has the ability to represent what you are doing. I don’t think any award in the world can have the ability to rightly justify your glories. But still, here’s a little one I have, that now, I wish, can belong to you. His Holiness Radhanath Maharaja very mercifully visited us this morning, at our home in Pune. We shared this thought with him, and requested Maharaja to give this award to you whenever he would meet you next. He immediately, kindly agreed. And what a great timing!! Maharaja said he would be meeting you soon, on February 10. I couldn’t believe my ears! I understand that you are getting this letter and the trophy on February 10. 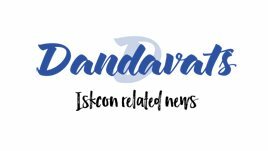 Aishwarya didi reminded me of another interesting thing: February 10 is Vasant Pancami, which is the 47th Sannyasa anniversary of His Holiness Tamal Krishna Maharaja! All this feels like a perfectly planned arrangement by Krishna! Maharaja, I, in no way, am qualified, but still I request you to please see this award coming as a gift not just from me, but as a gift from His Holiness Tamal Krishna Maharaja, which I am sure he would have loved to give you. I was sharing this with His Holiness Giriraj Maharaja also, and he was very happy to know this, and when I told him that His Holiness Radhanath Maharaja will be giving it to you, he said, “Perfect!” Seeing you all happy makes me really happy and satisfied. And how amazing, that I, who has always been so attached to my things, am not feeling sad, at all, in giving the only trophy I have. In fact, I am feeling extremely happy, that now, finally, it’s reaching the right hands! Also, it is not just me who is giving this to you. This award is from ALL those people – your Godsiblings, your disciples, followers, admires, well-wishers… this is from all those who you have deeply inspired, and are continuing to do so. Thank you very, very, very much. If it wasn’t for you, I would probably have been collapsing like anything right now. You are keeping me up straight, and are giving me the strength to show others how to be up straight and walking, despite all that might come our way. Maharaja, please bless me that I can become just like you. Just. Like. You. Maharaja. I cannot even imagine how proud Srila Prabhupada must be of you. Please bless me that I can make my Gurus more and more proud of me, if not as much as you are making Srila Prabhupada proud, at least half of it, or even just one fourth. Along with this letter is also a picture of me receiving this award. I thought you’d be happy to see it, and it feels more complete with that photo. I hope you have a totally wonderful time with your dear Godbrother, His Holiness Radhanath Maharaja. I pray you are doing great, as always!!! I can’t wait to meet you, and look forward to having another video call with you soon. I have so much to tell you! P.S. I look forward to seeing pictures and videos of you receiving this little gift. Jayapataka Swami after receiving the gift later in his class thanked her for the gift and said that Madana-mohana-mohini actually deserves the gift.